Lightening streaked across the western sky. Whitecaps smashed against Key West’s Sunset Pier. Thunder exploded deep into my bones. I shuddered, but kept a brave face. Within minutes it was gone, as quickly as it had come. Brilliant sunlight replaced the ominous black clouds. I looked to the East from the safety of my balcony retreat. A soft rainbow arch framed my world. I thought of the pot of gold waiting for me at the end of the rainbow. All my dreams would be fulfilled if I had that pot of gold. How many of us race through life thinking we would be happy if we were thinner, wealthier, smarter or prettier, ignoring the gifts that are in front of our noses today? I am guilty of being blind to the beautiful roses at the edge of the deck, turning a deaf ear to the birds’ songs, opting to read a self improvement book instead of throwing the ball for the patient pup at my feet and taking for granted the gourmet meal the my husband created to please me. My elusive pot of gold is intangible. It resonates in my soul. As I strive to learn and grow, I must never forget that with every breath I take, I am living the dream now in the world that I have created. 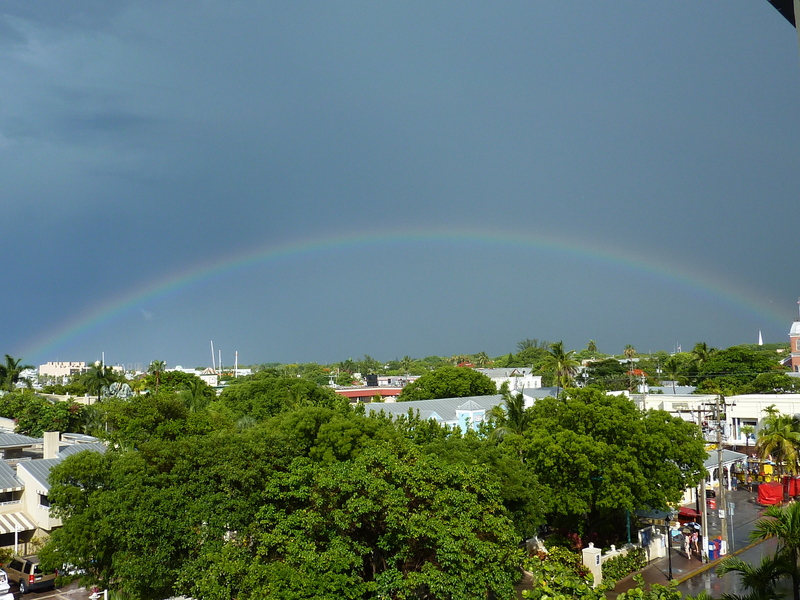 Posted on June 27, 2013, in Conch Republic, Key West and tagged books, Conch Republic, creative writing, Key West, rainbow, Rainbow. Bookmark the permalink. Leave a comment.